Sometimes you do not know you are hungry until you see or smell a plate of food. I did not know I was in need of a “Communication Snack” until I started reading this book. Whether lawyers are talking with prospective or current clients about their legal needs or communicating with the other side in litigation or transactional matters, the ability to communicate our position, strategy and goals is essential to what we do. Yet, once we are out of law school, do we actually spend any time refining the craft of communication? If, as it was for me, the answer to that question is “no,” you are likely to find something enlightening, helpful or just plain interesting in Communication Snacks: 52 Bite-Sized Communication Tips for the Busy Professional. 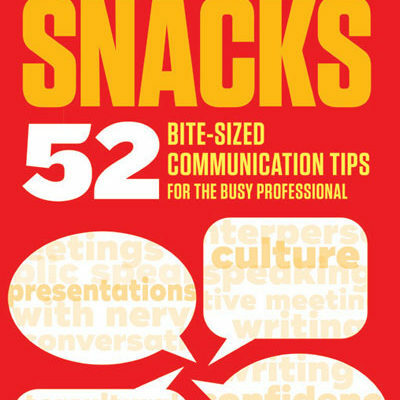 As its title suggests, this pocket-sized compendium is broken into 52 “communication snacks” that the authors suggest be ingested one at a time. Each snack is approximately a page in length, which makes them easily digestible, whether you want to review and practice one snack a week over a year or gorge on them in a much shorter period of time. True to form, I could not control my snacking and finished this pint-sized book over the course of a few evenings. The snacks address a diverse set of written and oral communication topics, ranging from common grammar mix-ups to the proper amount of eye contact to how cultural differences impact how we communicate. As I was reading the book, I was struck by how many of the topics reminded me of discussions and issues addressed in a National Institute for Trial Advocacy (NITA) course that I took several years ago. The snacks provided a great refresher on some key communication strategies covered in that course. For example, in Communication Snack No. 10, titled “Command Attention Through Silence,” the authors note that many speakers too often start their presentations with a throwaway word or phrase like “so,” “um” or “okay, well.” The authors recommend countering this somewhat natural urge with the “use of a deliberate 2-3 second silent pause before you speak.” This snack echoed NITA’s suggestion that a slight pause before beginning an argument or before moving on to the next line of questioning can be invaluable both as a way of focusing on what was just said (by you or the other party) and as a way of avoiding throwaway words that only distract from the force of your presentation. While some snacks directly reminded me of communication strategies that I could use every day, I found many of the other snacks interesting even though I did not immediately see their relevance to my professional life. For example, the authors pose the following question in Snack No. 18: “In a presentation, conversation, or meeting, who is responsible for making sure the key message is understood and the proper conclusion reached?” It seemed obvious to me that the presenter is responsible for ensuring that the proper message and conclusion are delivered to all participants. However, the authors note that this is true because in the United States we have a “speaker-responsible” culture. In many cultures, those that the authors define as “listener-responsible,” the presenter is tasked with presenting all of the relevant facts, and the onus is on the listener to reach the proper conclusion from those facts. As I deal almost exclusively with others who live and work in our speaker-responsible culture, this particular snack did not seem to apply to my professional life. However, upon fully digesting it, I realized that the speaker/listener-responsible dichotomy is actually highly relevant to litigation. A trial is essentially a miniature version of what happens in a listener-responsible culture, where the attorney’s job is to present the relevant information so that the judge or jury reaches the conclusion he or she wants. A well-planned strategy on how to convey your side’s message to the trier of fact is an essential part of trial preparation. Eric Jaworski is an attorney at Heizer Paul LLP, where he leads the firm’s Real Estate Practice Team and participates in the Litigation Practice Team. He can be reached at ejaworski@hpfirm.com.